This session will enable you to see if technique is firmly embedded, and whether your players can continue to perform when they are put under pressure. 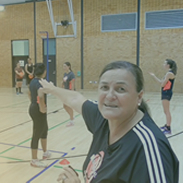 An adaptable session, you will be able to vary the pressure placed on individuals based on their level, so that you can ensure that each player is training at the top of their capabilities. The focus of this session is on keeping possession of the ball whilst moving forward; looking for space and performing passes with accuracy even when being challenged. The session begins with 2 simple passing drills allowing players to practise dummies, footwork and clean passes on the move whilst being challenged. These skills are then used in a 2 vs 2 game situation, which you will adapt to the abilities of the players by changing the time and space available to them. Players then run 3 vs 2 with the defenders and attackers changing position based on which colour you decide for each run. Finally there will be a passing specific warm down to wrap up the session. 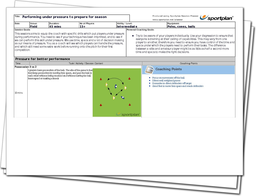 The overall aim of the session is to simulate game pressures in a training environment where you can critique your players technique and immediately put into practise any changes.